본 발명은 멀티미디어 스트림의 송신을 위한 방법 및 통신 시스템에 관한 것이다. The present invention relates to a method and communication system for the transmission of the multimedia stream. 멀티미디어 스트림은 통신 시스템에서 송신 통신 장치로부터 적어도 부분적으로 무선 통신 네트워크를 통하여 수신 통신 장치로 송신된다. The multimedia stream is transmitted to a receiving communication device via a wireless communication network, at least in part, from the transmitting communication apparatus in a communication system. 멀티미디어 스트림에 관한 정보는 네트워크 자원의 예약을 위한 적어도 하나의 멀티미디어 스트림 송신 파라미터를 포함하여 수신 통신 장치로 송신된다. Information about the multimedia stream is transmitted to a receiving communication device including at least one multimedia stream, the transmission parameters for the reservation of network resources. 파라미터는 송신에 필요한 최대 비트 레이트 또는 송신에 이용될 최대 서비스 데이터 유닛 사이즈이다. Parameter is the maximum service data unit size to be used for the maximum bit rate or transmission needed for transmission. 언급된 양 파라미터들은 세션 기술 프로토콜의 속성으로서 송신되는 것도 가능하다. The amount parameter mentioned may in be transmitted as attributes of the session description protocol. 바람직한 실시예에서, 수신 통신 장치는, 무선 통신 네트워크가 송신을 위해 부여한 QoS 프로파일 파라미터들에 관하여 송신 통신 장치에 통지한다. In a preferred embodiment, the receiving communication device informs the sending communication device about the QoS profile parameters granted by the wireless communication network for transmission. 본 발명은 멀티미디어 스트림이 송신 통신 장치로부터 적어도 부분적으로 무선 통신 네트워크를 통하여 수신 통신 장치로 송신되는 통신 시스템에서의 방법에 관한 것이다. The invention relates to a method in a communication system to be transmitted to the receiving communication device via a wireless communication network, at least in part, from the sending communication device is a multimedia stream. 또한, 본 발명은 송신 통신 장치, 수신 통신 장치 및, 송신 통신 장치에서 적어도 부분적으로 무선 통신 네트워크를 통하여 수신 통신 장치로 멀티미디어 스트림을 송신하는 통신 네트워크를 포함하는 통신 시스템에 관한 것이다. The present invention also relates to a communication system comprising a communication network for transmitting a sending communication device, a receiving communication device and the multimedia stream to the receiving communication device via a wireless communication network, at least in part, from the transmitting communication device. 또한, 본 발명은 송신 통신 장치 및 수신 통신 장치에 관한 것이다. The invention further relates to a sending communication device and a receiving communication device. 본 명세서에서, 송신 통신 장치라는 용어는 통신 네트워크로 멀티미디어 스트림을 송신하도록 구성된 송신기를 포함하는 통신 장치를 말한다. As used herein, the term sending communication device refers to a communication device including a transmitter configured to send multimedia streams to a communication network. 수신 통신 장치라는 용어는 각각 통신 네트워크로부터 멀티미디어 스트림을 수신하는 수신기를 포함하는 통신 장치를 말한다. The term receiving communication device refers to a communication device including a receiver for receiving multimedia streams from the communication network, respectively. 동일한 통신 장치는, 송신기와 수신기 양자를 포함하여, 통신 네트워크를 통한 일방향 또는 쌍방향 통신을 가능하게 할 수 있음이 명백하다. The same communication apparatus, it is obvious that, including a transmitter and a receiver both, may enable the one-way or two-way communication via a communications network. 무선 통신 장치는 무선 통신 네트워크에서 무선 통신을 실현하는 송신기 및/또는 수신기를 포함한다. The radio communication apparatus comprises a transmitter and / or receiver for implementing wireless communication in a wireless communication network. 이동 통신 시스템과 같은 무선 통신 시스템이라는 용어는 일반적으로, 무선 통신 장치의 사용자가 시스템의 동작 범위내에서 이동중일 경우, 무선 통신 장치와 시스템의 고정부 사이에 무선 데이터 송신 접속을 가능하게 하는 임의의 통신 시스템을 말한다. The term wireless communication system, such as a mobile communication system, generally, if the user of the radio communication device be moving within the system's operating range, and any that enables the wireless communication device and a wireless data transmission connection between the system fixing It refers to the communication system. 통상적인 무선 통신 시스템은 공중 육상 이동 네트워크(PLMN)이다. A conventional wireless communication system is a public land mobile network (PLMN). 공지의 예는 GSM(Global System for Mobile Telecommunications) 시스템이다. A well-known example is the GSM (Global System for Mobile Telecommunications) system. 본 발명은 제3 세대 이동 통신 시스템에 관한 것이면 바람직할 수 있다. The present invention may be preferred as long as it relates to the third generation mobile communication system. 예를 들어, 범용 이동 통신 시스템(UMTS)는 이런 제3 세대 통신 시스템의 일례로서 이용된다. For example, the Universal Mobile Telecommunications System (UMTS) is used as an example of such a third-generation communication system. 제3 세대 시스템에서, 베어러(bearer) 서비스 및 서비스라는 용어가 이용된다. In the 3G system, the bearer (bearer) service and service the term is used. 베어러 서비스는 액세스 포인트 사이에서 신호들을 송신하는 기능을 제공하는 통신 서비스 타입이다. Bearer service is a communication service type, which provides the ability to transmit signals between access points. 일반적으로, 베어러 서비스는 예를 들어, 정보가 무선 통신 장치와 시스템의 다른 부분 사이에서 송신될 때 시스템에서 이용될 데이터 송신 레이트 및 서비스 품질(QoS)을 정의하는 트래픽 채널의 이전 용어에 대응한다. In general, the bearer service, for example, corresponds to the previous term of the traffic channel information that defines the data transmission rate and Quality of Service (QoS) to be used by the system when the transmission between the different parts of the wireless communication devices and systems. 무선 통신 장치와 기지국 사이의 베어러 서비스는, 예를 들어, 무선 베어러 서비스이고, 무선 네트워크 제어 유닛과 코어 네트워크 사이의 베어러 서비스는 예를 들어서, Iu 베어러(인터페이스 UMTS 베어러) 서비스이다. Bearer service between the wireless communication device and the base station is, for example, a radio bearer service, and the bearer service between the radio network control unit and the core network is picked up for example, Iu bearer (Interface UMTS bearer) service. UMTS 시스템에서, 무선 네트워크 제어 유닛과 코어 네트워크 사이의 인터페이스는 Iu 인터페이스로 불린다. In the UMTS system, the interface between the radio network control unit and the core network is called the Iu interface. UMTS에서는 Iu 인터페이스에 부가하여 Gb 인터페이스로 불리는 인터페이스를 또한 이용하는 소위 GERAN 부분도 있다. In UMTS there is also the so-called GERAN part using an interface called as Gb interface in addition to the Iu interface also. 이와 관련해서, 태스크(태스크들)을 수행하기 위해 서비스가 이동 통신 네트워크에 의해서 제공되는데, 예를 들어 데이터 서비스는 통신 시스템에서 데이터 송신을 수행하고 전화 서비스는 전화 통화, 멀티미디어 등에 관 련된다. In this regard, there is a service to perform a task (tasks s) provided by the mobile communication network, for example, data services perform data transmission in a communication system, telephone services are relevant tube in telephone calls, and multimedia. 따라서, 서비스는 무선 통신 장치와 시스템의 고정부 사이의 전화 통화 또는 멀티미디어 스트림의 송신과 같은 데이터 송신을 요구한다. Thus, the service requires data transmission, such as transmission of telephone calls or multimedia streams between the fixed part of the wireless communication devices and systems. 제3 세대 이동 통신 시스템의 동작 중 중요한 태스크는, 각각 요청된 서비스가 가용 대역폭을 낭비함이 없이 이동국에 할당될 수 있는 방식으로 베어러 서비스를 제어(필요에 따라, 초기화, 유지 및 종료)하는 것이다. The key of the operation of a 3G mobile communication system tasks, to the respective requested service controlling the bearer services in such a way that it can be allocated to mobile stations without wasting the available bandwidth (as needed, the initialization, maintenance, and termination) . 서비스 품질은 예를 들어, 어떻게 프로토콜 데이터 유닛(PDU)이 송신 동안에 이동 통신 네트워크에서 처리되는지를 결정한다. Quality of service, for example, determines how protocol data units (PDU) are processed in the mobile communication network during the transmission. 예를 들어, 접속 어드레스들에 대해 정의된 QoS 레벨은 특히 2 이상의 접속이 동시에 송신될 패킷을 가질 때, 서포트 노드 및 게이트웨이 서포트 노드에서 송신 순서를 제어하고, (패킷 스트링들을) 버퍼링하며, 그리고 패킷들을 거부하는데 이용된다. For example, the buffering (packet strings), the QoS levels are, especially when it has a packet is two or more connections is transmitted at the same time, controls the transmission order from the support node and the gateway support node, and defined for connection addresses, and the packet It is used to reject them. 상이한 QoS 레벨은 예를 들어, 상이한 비트 레이트 뿐만 아니라 상이한 접속단들 사이의 패킷 송신에 대한 상이한 지연을 결정한다. Different QoS levels, for example, as well as different bit rates determine different delays for packet transmissions between the different connection end. 또한, 거부 그리고/또는 소실된 패킷 데이터 유닛의 수는 상이한 QoS 레벨들과 관련하여 변화할 수 있다. Further, the rejection and / or the number of the lost packet data units may vary in connection with the different QoS levels. 각각의 PDP 컨텍스트에 대하여 상이한 QoS를 요청하는 것이 가능하다. It is possible to request a different QoS for each PDP context. 예를 들어, 이메일 접속에서, 상대적으로 긴 지연이 스트림 송신에서 허용될 수 있다. For example, in e-mail connections, a relatively long delay can be allowed in the transmission stream. 그러나, 비디오 컨퍼런싱과 같은 실시간 쌍방향 애플리케이션은, 하이 레이트의 패킷 송신을 요구한다. However, real-time interactive applications such as video conferencing, require packet transmission of the high rate. 파일 전송과 같은 어떤 애플리케이션에서, 패킷 교환식 송신이 무결한 것이 중요하며, 오류 환경에서는 필요하다면 패킷 데이터 유닛이 재송신된다. In some applications, such as file transfers, it is important that the packet switched transmission integrity, if necessary, the error setting the packet data units are retransmitted. UMTS 시스템의 패킷 교환식 통신 서비스에 대해서, 4개의 상이한 트래픽 클 래스들의 정의가 제안되어 왔으며, 이들 트래픽 클래스들의 특성에 대해서, 상이한 접속 타입에 대해 상이한 기준을 고려하는데 그 목적이 있었다. For packet-switched communication service in the UMTS system, has the definition of four different traffic classes has been proposed, for the properties of these traffic classes, to consider the different criteria for the different connection types had the purpose. 제1 클래스 및 제2 클래스들에 대해 정의된 하나의 기준은, 송신이 실시간으로 발생한다는 것이며, 그 송신은 상당한 지연을 가져서는 안된다. The one of reference defined for the first class and the second class, they will transmit the generated real time, the transmission should not have a significant delay. 그러나, 이러한 클래스들에서, 데이터 전송의 정확성은 그렇게 중요한 성질이 아니다. However, in such classes, the accuracy of the data is not so important properties. 상응하는 방식으로, 비-실시간 데이터 송신은 제3 트래픽 클래스 및 제4 트래픽 클래스에 대해서는 충분하지만, 상대적으로 정확한 데이터 송신이 그 클래스들에 대해 요구된다. A corresponding way, the non-real-time data transmission for a third traffic class, and fourth traffic classes, but sufficient, a relatively accurate data transmission is required for the given class. 실시간 제1 클래스 통신의 예는 2 이상의 사람들이 무선 통신 장치들에 의해 서로 논의하고 있는 환경에서의 대화 신호들의 송신이다. Examples of real-time first class communication is the transmission of the at least two people talk signal in which to discuss with each other by wireless communication device environment. 실시간 제2 클래스 통신이 실행가능한 환경의 예는, 즉시 보기 위한 비디오 신호의 송신이다. Examples of the real-time a viable environment second class communication is an instant transmission of a video signal for viewing. 비-실시간 패킷 통신인 제3 클래스는, 예를 들어 합당한 레이트의 상대적으로 정확한 데이터 송신이 실시간 데이터 송신보다 더 중요한 인자인, 인터넷 홈페이지의 브라우징과 같은, 데이터베이스 서비스들의 이용에 이용될 수 있다. Non-real-time packet transmission of the third class include, for example, in a relatively accurate data transmission in a reasonable rate is more important factor than the real-time data transmission, it may be used for the use of database services, such as browsing of the Internet home page. 이 예에 따른 시스템에서, 예를 들어 이메일 메시지들 및 파일들의 전송은 제4 카테고리로 분류될 수 있다. In the system according to the present example, for example, the transmission of email messages and files can be classified to the fourth category. 물론, 트래픽 클래스들의 수는 여기에 언급된 바와 같이, 반드시 4개일 필요가 없으므로, 본 발명은 다수의 트래픽 클래스들을 포함하는 패킷 교환 통신 시스템에도 적용될 수 있다. Of course, the number of traffic classes is, as mentioned herein, it is not necessary to 4 days, the present invention may be applied to a packet switched communications system including a plurality of traffic classes. 4가지로 나타낸 트래픽 클래스들의 특성들이 표 1에 간략하게 나타나 있다. Four characteristics of the traffic class are shown by shown briefly in Table 1 below. 보증된 비트 레이트는 RAN 및 CN에서 승인 제어 및 자원 예약용으로 이용되고, 최대 비트 레이트는 CN에서 폴리싱용으로 이용되고, 즉 최대 비트 레이트보다 크지 않은 비트 레이트는 GGSN에서 CN에 들어가는 것이 허용되며, 이 비트 레이트를 초과하는 패킷들은 감소된다. Guaranteed bit rate is used for admission control and resource reservation at the RAN and CN, the maximum bit rate is used for policing at the CN, i.e. the bit rate is not greater than the maximum bit rate is allowed in the GGSN into the CN, packets that exceed this bit rate are reduced. 현대의 제2 및 제3 세대 무선 통신 장치들은 이전의 무선 통신 장치들보다 훨씬 나은 데이터 처리 특성을 갖는다. Second and third generation wireless communication device of a modern have much better data processing properties than older wireless communication devices. 예를 들어, 그것들은 이미 무선 통신 장치에서 인터넷에 접속되며 브라우징 애플리케이션을 이용하여 인터넷으로부터 정보를 검색하는 기능을 지니며, 미래에는 예를 들어, 실시간 비디오 컨퍼런스 등에 대한 멀티미디어 통화들을 설정하는 것이 가능해질 것이다. For example, they may already be connected to the Internet in a wireless communication device become possible to set up multimedia calls to said Genie the ability to retrieve information from the Internet using a browsing application in the future, for example, like real-time video conferences will be. 상이한 애플리케이션들의 요구사항들은 상당히 상이할 수도 있다. Requirements of different applications may be significantly different. 어떤 애플리케이션들은 송신기와 수신기 사이의 빠른 통신을 요구한다. Some applications require fast communication between the transmitter and the receiver. 이들 애플리케이션들은 예를 들어, 비디오 및 전화 애플리케이션들을 포함한다. These applications include, for example, video and telephone applications. 어떤 다른 애플리케이션들은 가능한 한 정확한 데이터 송신을 요구할 수 있지만, 데이터 송신 접속의 비트 레이트는 덜 중요하다. But any other applications may require as accurate data transmission as possible, the bit rate of the data transmission connection is less important. 이들 애플리케이션들은 예를 들어 이메일 및 데이터베이스 애플리케이션들을 포함한다. These applications include, for example, the e-mail and database applications. 그 반면에, 이들 애플리케이션들은 여러 무선 통신 장치에서 상이한 특성으로 이용될 수 있다. On the other hand, these applications can be used with different properties in many wireless communication devices. 무선 통신 장치의 사용자는 무선 통신 장치로 멀티미디어 프리젠테이션을 워칭하려고 할 수도 있다. The user of the wireless communication device may try watching a multimedia presentation with the wireless communication device. 사용자는 이런 프리젠테이션의 로딩 어드레스를 발견하고 무선 통신 장치로 프리젠테이션을 전송하도록 하는 요청을 전송한다. The user sends a request to find a loading address of such a presentation and to send the presentation to the wireless communication device. 이 요청은 통신 시스템에서 처리된다. The request is handled in the communication system. 요청된 멀티미디어 프리젠테이션의 로딩 어드레스는 인터넷의 서버와 같은, 통신 네트워크의 서버로 어드레싱할 수 있다. Loading address of the requested multimedia presentation may be addressed to the server of a communication network, such as a server on the Internet. 수신 무선 통신 장치로 멀티미디어 프리젠테이션을 전달하는 서버는 본 명세서에서 스트리밍 서버라고 언급된다. Server that delivers the multimedia presentation to the receiving wireless communication device is referred to as a streaming server in this specification. 통신 시스템은 스트리밍 서버와 무선 통신 장치 사이의 통신을 위해 충분한 자원들을 예약하여 요청된 멀티미디어 프리젠테이션을 전달할 수 있도록 해야 한다. Communications systems must be able to deliver a multimedia presentation request to reserve sufficient resources for communication between the streaming server and the wireless communication device. 그렇지 않으면, 프리젠테이션은 수신 무선 통신 장치에서 동일한 정확성과 무오류로 나타내질 수 없다. If not, the presentation can not be represented with the same accuracy and error free in the receiving wireless communication device. UMTS 통신 시스템에서 무선 통신 장치는 우선 특정한 QoS 파라미터들로 PDP 컨텍스트를 요청한다. A wireless communication device in a UMTS communications system, the first requests a PDP context with certain QoS parameters. 그 다음, 네트워크는 어떤 선택 기준들 예를 들어 무선 통신 장치가 아마도 그 요청에 사용한 파라미터들을 사용하여 접속에 대해 베어러 서비스를 선택한다. Then, the network selects a bearer service for the connection by using the parameters used for any selection criteria, for example the wireless communication device has possibly the request. 이러한 선택 기준들은 충분히 적합하거나 정확하지 않을 수 있는데, 이 경우에는 베어러 서비스가 접속에 대해 충분한 송신 용량을 제공할 수 없거나 또는 필요한 용량보다 큰 용량을 제공하는 상황이 생길 수 있음으로써, 네트워크 자원들의 사용이 효과적이지 않다. By that these selection criteria are enough may not be appropriate or accurate, in this case the bearer service can result in conditions that provide greater capacity than the capacity can not or necessary to provide sufficient transmission capacity for the connection, the use of network resources this is not effective. 멀티미디어 정보의 전달이 필요할 수 있는 다른 상황은, 2개의 무선 통신 장치들이 서로 통신하여 비디오나 정지 이미지들과 같은 멀티미디어 정보를 교환하는 것이다. Other situations that may require the delivery of multimedia information is to exchange multimedia information such as video or still images by the two wireless communication devices to communicate with each other. 또한 이러한 종류의 상황에서, 충분한 자원들은 통신을 위해 네트워크에 의해 예약되어야 한다. Also in this kind of situation, sufficient resources should be reserved by the network for communication. 그러나, 종래의 방법을 이용할 때, 접속을 위한 요구를 접속 양단에 통지하는 것이 항상 가능하지는 않다. However, when using the conventional method, it is not always possible to inform the request for connection to the connecting ends. 현재에는 애플리케이션, 예를 들어 비디오 애플리케이션에서 이용되는 최대 비트 레이트를 단 대 단으로 신호하는 방법은 없다. Currently, there is no way to signal the maximum bit rate to be used in applications, for example, video applications with end-to-end. 스트리밍 서버는 인코딩된 멀티미디어 스트림의 최대 비트 레이트를 스트리밍 클라이언트(수신 무선 통신 장치)로 신호할 수 없다. The streaming server can not signal the maximum bit rate of the encoded multimedia stream to the streaming client (the receiving wireless communication device). 후자는 보증된 비트 레이트에 관한 정보만을 가지지만 최대 비트 레이트에 관한 정보를 가지지는 않는다. The latter only have only information about the guaranteed bit rate does gajijineun information about the maximum bit rate. 그러므로, 클라이언트는 3가지 종류의 결정을 할 수 있다. Therefore, the client can be three types of decision. 첫번째로, 클라이언트는 보증된 비트 레이트(GBR)과 동일한 최대 비트 레이트(MBR)를 선택할 수 있다. First, the client may select the same maximum bit rate (MBR) and guaranteed bit rate (GBR). 이는 비트 레이트가 보증된 비트 레이트(=최대 비트 레이트)를 초과할 때마다 패킷 손실과 불량한 수신 품질을 일으킬 수 있다. This can lead to poor reception quality, packet loss whenever the bit rate exceeds the bit rate (= maximum bit rate) guarantees. 예를 들어, GBR=MBR=60kbps이고 압축된 비디오 소스 비트 레이트가 평균 60kbps로 인코딩되지만, 64kbps에서 어떤 산발적인 높은 비트 레이트 피크가 일어나게 되면 그 효과는 수신 단에서 특정 기간의 패킷 손실이 될 것이다(이 기간은 비트 레이트가 60kbps를 초과하는 시간과 동일하다). For example, GBR = MBR = 60kbps and encoded in a compressed video source bit rate is an average 60kbps, but when any sporadic high bit rate peaks at 64kbps to occur, the effect will be the packet loss for a specific period at a receiving end ( this period is equal to the time the bit rate exceeds the 60kbps). 이러한 상황을 피하기 위해서, MBR 및 GBR은 GBR=MBR=64kbps라는 식으로 설정될 수 있다. To avoid this situation, MBR and GBR could be set in a way that GBR = MBR = 64kbps. 이는 패킷 손실을 피할 것이지만, 60kbps와 64kbps 사이의 대역폭이 항상 이용되지 않아서 평균 4kbps의 낭비를 초래하기 때문에, 과-엔지니어링(over-engineering)을 통하여 네트워크 자원을 처리하는 비효율적인 방법이 된다. This is an inefficient way of handling network resources through engineering (over-engineering) - but which avoid the packet loss, and did not use the bandwidth between 60kbps and 64kbps always, as they result in an average of 4kbps waste, and. 둘째로, 클라이언트는 어떤 추정을 함으로써 보증된 비트 레이트보다 높은 최대 비트 레이트를 선택할 수 있다. Second, the client may choose a maximum bit rate higher than the guaranteed bit rate by making some estimates. 클라이언트가 비트 레이트에 관한 과거 이력 정보를 이용하더라도, 일반 서버에 의해 이용되는 최대 비트 레이트가 쉽게 예측될 수 없기 때문에, 이들 추정은 부정확할 수 있다. Because even if the client uses past history information about the bit rate, the maximum bit rate used by a generic server can be easily predicted, these estimates may be inaccurate. 또한, 이 경우에 패킷 손실들이 일어날 수 있다. Also, if you happen to be in this packet loss. 셋째로, 클라이언트는 네트워크로부터 최대로 신청된 비트 레이트로 다운그레이딩(downgrading)을 얻기 위하여 매우 높은 최대 비트 레이트값을 선택할 수 있다. Third, the client may choose a very high maximum bit rate value, in order to obtain up-down-graded (downgrading) to the bit rate from the network to the application. 제2 해법 및 제3 해법은, 스트리밍 서버가 UMTS 베어러의 최대 비트 레이트를 통지받지 못해서 송신 비트 레이트 및 대역폭 적응 알고리즘에 관해 아마도 잘못된 가정을 하기 때문에 어떤 비효율성을 초래한다. The second solution and the third solution, the streaming server, which results in inefficiency due to the possibly faulty assumptions about transmission bit rate and bandwidth adaptation algorithms did not receive the notification of the maximum bit rate of the UMTS bearer. 이동 통신 장치의 대화식 멀티미디어 애플리케이션은 다른 이동 통신 장치로 세션의 최대 비트 레이트를 신호할 수 없다. Interactive multimedia applications in mobile communication devices can not signal the maximum bit rate of the session to the other mobile communication device. 이것은 각각의 통신 장치가 (대칭적으로) 어떤 보증된 비트 레이트에서 다른 통신 장치가 멀티미디어 스트림들을 인코딩할 것인지를 알 수 있다는 것을 의미한다. This means that the other communication device in which the guaranteed bit rate that each communication device (symmetrically) will know whether to encode the multimedia streams. 그러나, 각각의 통신 장치는 (대칭적으로) 다운링크 최대 비트 레이트가 무엇인지 알 수 없을 것이다. However, each communication device will not be able to know what is the downlink maximum bit rate (symmetrically). 즉, 각각의 통신 장치는 어떤 최대 비트 레이트에서 다른 통신 장치가 멀티미디어 스트림을 인코딩할 지 알 수 없게 될 것이다. In other words, each communication device will not be able to know if the other communication apparatus in which the maximum bit rate to encode the multimedia streams. 또한, 이 경우에 이동 통신 장치는 상술한 3개의 대안 중 하나를 선택하도록 결정할 수 있다. In addition, the mobile communication apparatus in this case may decide to choose one of the three alternatives mentioned above. 또한 이 상황에서 상술한 대안 중 어느 하나의 선택은, 각각의 통신 장치가 어떤 최대 비트 레이트에서 각각의 인코더들이 미디어 흐름을 인코딩할 것인지를 알 수 없기 때문에, 스트리밍에 대해 상술한 것과 유사한 문제를 일으킬 것이다. In addition, any selection of one of the above alternatives in this situation, each communication apparatus, because at some maximum bit rate can be seen each of the encoders whether to encode the media flow, causing similar problems to those described above for streaming will be. 또한, 대화식 멀티미디어 애플리케이션은 일방적 통신 애플리케이션(일방향 대화식 멀티미디어 애플리케이션) 또는 일-대-다 통신 애플리케이션(멀티캐스트 또는 브로드캐스트)일 수 있다. In addition, interactive multimedia applications are one-way communication application (unidirectional conversational multimedia application) or a one-may be a multi-communication application (multicast or broadcast) for. 멀티미디어 스트리밍 세션도 일-대-다 통신 애플리케이션일 수 있다. Multimedia streaming sessions also one - can be a multi-communication applications - for. 현 시스템에서, 무선 통신 장치 및 이동 통신 네트워크는 QoS 요구사항이 충족될 수 있는 그러한 베어러 서비스를 선택하도록 교섭한다. In the current system, a wireless communication device and the mobile communication network negotiate to select such a bearer service QoS requirements can be met. 예를 들어, UMTS 표준에 따른 시스템에서, 무선 통신 장치는 소망의 서비스 품질을 자유롭게 요청할 수 있는데, 이 경우 UMTS 이동 통신 네트워크가 무선 통신 장치에 의해 요청된 서비스 품질을 제공할 수 있을 지를 검사한다. For example, in the system according to the UMTS standard, the wireless communications device may request a quality of service desired free, in which case the UMTS mobile communication network examines if it can provide the quality of service requested by the wireless communication device. 무선 통신 장치에서 실행될 애플리케이션이 QoS 요구사항을 포함한다면, 무선 통신 장치는 이들 QoS 요구사항을 그 자체로 베어러 서비스의 선택을 위해 이동 통신 네트워크로 송신한다. If the application is to be executed including those QoS requirements in a wireless communication device, wireless communication apparatus transmits to the mobile communication network, for the selection of the bearer service the requirements of these QoS requirements as such. 그러나, 애플리케이션이 무선 통신 장치로 QoS 요구사항을 송신하지 않는다면, 특정의 특성들이 접속을 위해 선정된 경우, 네트워크에 저장된 디폴트 QoS 프로파일이 (통상적으로 홈 로케이션 레지스터(HLR)에서) 이용되는 것이 일반적이다. However, the application does not transmit QoS requirements to the wireless communication device, it is common to be used if a specific property are selected for the connection, (in typically a Home Location Register (HLR)), the default QoS profile stored in the network . 무선 통신 장치의 특성이 모든 면에서 애플리케이션에 대해 요청된 서비스 품질을 만족시키지 못한다면, 애플리케이션의 성능은 아마도 적절하지 않을 것이다. The properties of wireless communication devices unless not satisfy the quality of service requested for the application in all respects, the performance of the application is probably not appropriate. 최대 비트 레이트에 부가하여, 다른 파라미터인, 다른 접속 파티, 즉 스트리밍 서버 및/또는 송신 통신 장치에 의해 알려지지 않은 최대 서비스 데이터 유닛(SDU) 사이즈 파라미터가 있다. In addition to the maximum bit rate, and other parameters of the other connected parties, i.e., the maximum service data unit (SDU) size parameter is unknown by the streaming server and / or the sending communication device. SDU 사이즈 파라미터는 스트리밍 서버에 의해 송신되는 멀티미디어 스트림의 패킷들의 사이즈를 기술한다. SDU size parameter describes the size of the packets of the multimedia stream transmitted by the streaming server. 따라서, 스트리밍 클라이언트는, 스트리밍 클라이언트가 모든 패킷들을 수신할 수 있도록 충분히 큰 값을 최대 SDU 사이즈용으로 선택해야 한다. Thus, the client streaming, streaming The client must choose a sufficiently large value so that it can receive all packets for the maximum SDU size. 스트리밍 클라이언트는 임의의 값을 시험해보거나 SDU 사이즈에 대해 최대로 허용가능한 값을 선택할 수 있다. Streaming clients try to view an arbitrary value can be selected as the maximum acceptable value for the SDU size. 이런 종류의 선택은 불필요한 자원들이 멀티미디어 스트리밍 세션에 대해 예약되게 할 수 있다. This type of selection may be unnecessary resources are reserved for multimedia streaming sessions. 또한, 스트리밍 클라이언트가 네트워크로(예를 들면 요청에 있어서 최대 비트 레이트 및 최대 SDU 사이즈 파라미터를 나타내는) 자원 할당 요청을 송신할 때, 네트워크는 요청된 자원들을 예약할 수 없는(뿐만 아니라, 예약하는 것이 불가능한) 일이 일어날 수도 있다. Further, it is when the streaming client to send (maximum bit rate and maximum SDU size indicates a parameter in the request, for example), the resource allocation request to the network, the network not only can not schedule the requested resources (, reserving the impossible) one may occur. 종래 시스템에서, 스트리밍 클라이언트는 할당된 자원들을 스트리밍 서버로 통지할 수 없다. In prior art systems the streaming client can not inform the allocated resources to the streaming server. 그러므로, 스트리밍 서버는 무선 통신 네트워크와 무선 통신 장치 사이의 접속에 적절한 것보다 더 큰 데이터 유닛으로 멀티미디어 스트림을 송신하는 일이 일어날 수 있다. Therefore, the streaming server may happen for transmitting a multimedia stream in larger data units than to a proper connection between the wireless communication network and a wireless communication device. 어떤 고정된 바이트 수(예컨데, 1500바이트)가 항상 QoS 프로파일에서 이용된다면, 이는 네트워크에서 비효율성을 초래하고 이러한 비효율성은 패킷 교환 스트리밍 클라이언트로 더 낮은 미디어 품질을 제공할 수 있다. If any fixed number of bytes (for example, 1500 bytes) is always used in the QoS profile, which leads to inefficiencies in the network and these inefficiencies can provide a lower media quality to the packet switched streaming client. 사실, 모든 패킷들을 고정된 사이즈로 가정하는 네트워크는, 패킷들이 더 클수록 선정된 값 아래로 목표 SDU 에러율을 유지하는 것이 더 어려워지기 때문에, QoS 프로파일에서 소정의 지연을 가지고 타겟 SDU 에러율을 유지하는데 더 많은 어려움을 가지게 될 것이다. In fact, the network assuming all the packets of a fixed size, since it is more difficult to keep the target SDU error rate below a packet are greater the predetermined value, in maintaining the target SDU error ratio with the given delay in the QoS profile, more It will have a lot of difficulties. 따라서, 본 발명의 목적은, 송신 통신 장치로부터 수신 통신 장치로 멀티미디어 프리젠테이션을 송신하기 위해 네트워크 자원들의 적절한 선택용으로 요청된 멀티미디어 프리젠테이션의 특성을 통지하는 방법 및 시스템을 제공하는 것이다. Accordingly, it is an object of the present invention to provide a method and a system for informing the properties of the requested multimedia presentation for proper selection of network resources to transmit the multimedia presentation to the receiving communication device from the transmitting communication device. -최대 서비스 데이터 유닛 사이즈 중 적어도 하나를 통지받는 것을 특징으로 한다. - characterized by being informed of at least one of the maximum service data unit size. 네트워크 자원의 예약을 위하여 수신 통신 장치로 적어도 상기 파라미터를 송신하는 송신기를 포함하는 것을 특징으로 한다. Characterized in that at least a transmitter for transmitting the parameter to the receiving communication device for reservation of network resources. 네트워크 자원 예약을 위해 수신 통신 장치로 적어도 상기 속성 필드를 송신하는 송신기를 포함하는 것을 특징으로 한다. Characterized in that at least a transmitter for transmitting the attribute field to the receiving communication device for reservation of network resources. -부여된 전송 지연 중 적어도 하나를 포함하는 부여된 네트워크 자원에 관한 정보를 상기 송신 통신 장치로 송신하는 송신기를 또한 포함할 수 있는 것을 특징으로 한다. - The information of the granted transfer delay to a network resource grant comprising at least one characterized in that it can also include a transmitter for transmitting to the transmitting communication device. 본 발명은 종래 기술의 시스템 및 방법과 비교해볼 때 상당한 이점을 가진다. The invention has significant advantages when compared to systems and methods of the prior art. 본 발명은 스트리밍 클라이언트가 스트리밍 서버에 의해 송신된 사전에-인코딩된 멀티미디어 스트림의 최대 비트 레이트를 인식할 수 있도록 한다. The present invention is a streaming client to a pre-transmitted by the streaming server and to recognize the maximum bit rate of the encoded multimedia stream. 이는 더 정확한 QoS 프로파일 파라미터들을 지정함으로써 더 양호한 베어러 할당을 허용한다. This allows a better bearer allocation by specifying a more precise QoS profile parameters. 또한, 대화식 멀티미디어 애플리케이션의 이점은, 멀티미디어 스트림을 인코딩할 때 이동 통신 장치가 다른 파티로부터 이용된 최대 비트 레이트를 인식한다는 사실이다. Further, the advantages of the conversational multimedia application is a fact that the mobile communication device to encode the multimedia streams recognize the maximum bit rate used from the other party. 또한, 이것은 더 정확한 QoS 프로파일 파라미터들을 지정함으로써 더 양호한 베어러들의 할당을 허용한다. In addition, this allows the allocation of more preferred bearers by specifying more precise QoS profile parameters. 다른 중요한 이점은 최대 비트 레이트-보증된 비트 레이트로서 계산된 델타 대역폭을 효율적으로 이용하도록 하는 가능성에 있다. Another important advantage is the maximum bit rate - is the possibility that to efficiently use the delta bandwidth computed as a guaranteed bit rate. 이 대역폭은 대역폭 적응 또는 비디오 비트 레이트의 피크 처리에 이용될 수 있다. This bandwidth can be used for bandwidth adaptation or for handling peaks video bit rate. 마지막으로, 예를 들어 비트 레이트상에 영향을 끼치는 인코딩 파라미터들을 신속하게 변경함으로써, 실시간으로 멀티미디어 스트림들을 인코딩할 때 최상의 미디어 품질을 전달하는데 상기 델타 대역폭이 이용될 수 있다. Finally, for example, bit by quickly changing the encoding parameters that affect the rate, there is the delta bandwidth can be used to deliver the best media quality when encoding multimedia streams in real-time. SDP의 최대 비트 레이트 파라미터의 또 다른 이점은, 컨텐트가 패킷 교환 스트리밍 서버에 의해 상이한 비트 레이트로 제공되는 경우, 패킷 교환 스트리밍 클라이언트가 부여된 QoS 프로파일 파라미터에 따라 상이한 대안 중에서 선택할 수 있다는 점이다. Another advantage of the maximum bit rate parameter in the SDP is that content can select from the packet switched streaming client according to the different alternatives is granted QoS profile parameters if provided by different bit rates by the packet switched streaming server. 본 발명의 방법에 의하면, 어떤 베어러 서비스가 접속에 대해 최적인지와 어떤 베어러 서비스가 송신 동안 상당한 데이터 손실을 일으키지 않는지를 선택하는 것이 가능하다. According to the method of the present invention, it is possible to any bearer service is a bearer service with which the optimum aware of the access select does not cause significant data losses during transmission. 또한, 본 발명의 방법을 이용함으로써, 네트워크 로딩이 최적화될 수 있는데, 그 이유는 접속들에 대해 너무 큰 자원들이 예약되어 있지 않기 때문이다. Further, by using the method of the present invention, the network loading can be optimized, because they do not have too large a resource reservation for the connection. 패킷 교환 스트리밍 서버로부터 패킷 교환 스트리밍 클라이언트로 최대 SDU 사이즈를 신호하는 이점은, PDP 컨텍스트가 적정한 파라미터값으로 무선 통신 장치에서 활성화될 수 있다는 사실에 따른다. The advantage of the signal maximum SDU size from the packet switched streaming server to the packet switched streaming client has to be in accordance with the fact that the PDP context can be activated in the wireless communication device to an appropriate parameter value. 그러므로, 멀티미디어 프리젠테이션을 클라이언트로 전달할 때, 더 양호한 미디어 품질이 달성될 수 있다. Therefore, when delivering a multimedia presentation to a client, there is a better media quality can be achieved. 또한, 네트워크는 타겟 SDU 에러율을 종래 시스템을 통해서보다 QoS 프로파일의 소정 지연을 통해 더 양호하게 유지할 수 있다. In addition, the network can be maintained better over a predetermined delay in the QoS profile than with prior art systems through the target SDU error rate. 패킷 교환 스트리밍 클라이언트와 패킷 교환 스트리밍 서버 사이에 부여된 QoS 프로파일 파라미터를 통신하는 장점은, 실제값을 인식하게 되는 패킷 교환 스트리밍 서버에 큰 이점을 제공한다. The advantage of communicating the granted QoS profile parameters between the packet switched streaming client and the packet switched streaming server, there is provided a great advantage to the packet switched streaming server that recognizes the actual value. 이러한 방식으로, 서버는 (새로운 최대 SDU 사이즈값을 처리하도록) 패킷화 방식을 변경할 것을 결정하고, 새로운 최대 비트 레이트값을 처리하도록 어떤 송신 레이트 제어 기술을 적용할 수 있다. In this way, the server is able to apply some transmission rate control technique to determine the change (new up to process the SDU size value) packetization strategy, processes the new maximum bit rate value. 일반적으로, 서버는 패킷 교환 스트리밍 클라이언트로 더 양호한 미디어 품질을 전개하도록 할 수 있다. Typically, the server can be to deploy a better media quality to the packet switched streaming client. 다음에서, 본 발명은 첨부된 도면을 참조하여 더 상세하게 설명될 것이다. In the following, the invention will be described in more detail with reference to the accompanying drawings. 도 1은 본 발명의 양호한 실시예에 따른 방법이 적용될 수 있는 시스템을 도시한다. Figure 1 illustrates a system that may be subject to a method according to the preferred embodiment of the invention. 도 2는 본 발명의 양호한 실시예에 따른 방법이 적용될 수 있는 다른 시스템을 도시한다. Figure 2 illustrates another system that may be subject to a method according to the preferred embodiment of the invention. 도 3은 본 발명의 양호한 실시예에 따른 무선 통신 장치를 단순화된 블록도로 도시한다. Figure 3 is a diagram of a simplified wireless communication apparatus according to a preferred embodiment of the present invention. 도 4a는 서버와 무선 통신 장치 간의 스트리밍 애플리케이션을 설정하는 예 를 도시한다. Figure 4a shows an example of setting up a streaming application between a server and a wireless communication device. 도 4b는 2개의 무선 통신 장치 사이의 대화식 애플리케이션을 설정하는 예를 도시한다. Figure 4b shows an example of setting up an interactive application between two wireless communication devices. 다음의 본 발명의 양호한 실시예의 상세한 설명에서, UMTS 타입 무선 통신 시스템은 예로서 이용될 것이지만, 당업자에게는 본 발명이 단지 이 시스템에 한정되는 것이 아니라 통신에 대한 다양한 QoS 레벨을 결정할 수 있는 다른 통신 시스템에도 적용될 수 있음이 명백할 것이다. In the following preferred embodiments of the detailed description of the present invention, UMTS type radio communication system, but is used as an example, those skilled in the art other communication system in which the present invention may not be only limited to the system to determine various QoS levels for communication even this can be applied will be apparent. 다음에서, 세션 기술 프로토콜(SDP)가 더 상세하게 설명될 것이다. In the following, will be described in Session Description Protocol (SDP) is more detailed. 인터넷 멀티캐스트 백본(M본)에서, 세션 디렉토리 툴은 멀티미디어 컨퍼런스를 광고하고 컨퍼런스 어드레스와 참가에 필요한 미디어-특정 정보를 통신하는데 이용된다. In the Internet multicast backbone (M present), the session directory tool is media advertising and multimedia conference needs to address the conference participants - is used to communicate certain information. 멀티미디어 백본은 IP(인터넷 프로토콜) 멀티캐스트를 지원하는 인터넷의 일부이고, 따라서 효율적인 다-대-다 통신을 허용한다. Multimedia is part of the Internet backbone that supports multicast IP (Internet Protocol), thus the efficient-to-many communication allows. 이것은 멀티미디어 컨퍼런싱에 광범위하게 이용된다. It is used extensively for multimedia conferencing. 그러한 컨퍼런스들은 일반적으로 엄격한 컨퍼런스 멥버쉽의 조정이 필요하지 않는 특성을 가지지만, 컨퍼런스를 수신하기 위해서, 멀티캐스트 백본 사이트의 사용자는 컨퍼런스의 멀티캐스트 그룹 어드레스 및 컨퍼넌스 데이터 스트림에 대한 UDP 포트를 알아야만 한다. Such conferences are only usually have a do not require adjustment of the rigid Conference mep membership characteristic, in order to receive a conference, a user of the multicast backbone site know the UDP port for the multicast group address and keonpeo nonce data stream of the conference do. 세션 디렉토리들은 컨퍼런스 세션들의 광고를 지원하고 관련 컨퍼런스 설정 정보를 가망이 있는 참가자에게 통신하다. Session Directory are supported by advertising conference sessions and communicate the relevant conference setup information to prospective participants in this. SDP는 이러한 정보를 수신자에게 전달하도록 설계된다. SDP is designed to convey such information to the recipient. SDP는 순전히 세션 기술에 대한 포맷이고, 이것은 전송 프로토콜을 통합하지 않으며, 세션 알림 프로토콜, 세션 초기화 프로토콜, 실시간 스트리밍 프로토콜(RTSP), MIME 확장을 이용한 전자 메일 및 하이퍼텍스트 전송 프로토콜을 포함하는 상이한 프로토콜들로 전달될 수 있다. SDP is purely a format for the session description, this is the different protocols that do not incorporate a transport protocol, including session notification protocol, Session Initiation Protocol, Real Time Streaming Protocol e-mail and Hypertext Transfer Protocol using (RTSP), MIME extension It can be delivered to. SDP는 범용이도록 의도되어서, 단지 멀티캐스트 세션 디렉토리보다는 더 광범위한 네트워크 환경 및 애플리메이션에 이용될 수 있다. SDP is intended to be so universal, it can only be used in a broader network environment and aepeulri animation rather than a multicast session directory. 멀티미디어 컨퍼런스는 통신에 이용되는 소프트웨어와 함께 2 이상의 통신중인 통신 장치들의 세트이다. Multimedia conference is a set of communication devices that are two or more communication with the software to be used in communication. 멀티미디어 세션은 멀티미디어 송신기 및 수신기들의 세트이고 송신기로부터 수신기로 흐르는 데이터 스트림이다. Multimedia session is a data stream flowing to the receiver and transmitter from a set of multimedia transmitter and the receiver. 멀티미디어 컨퍼런스는 멀티미디어 세션의 일례이다. Multimedia conference is an example of a multimedia session. 다음에는 세션 기술 프로토콜의 현재의 정의의 몇가지 세부사항이 2002년 5월 27일의 문서 "Internet Engineering Task Force: draft-ieft-mmusic-spd-new-10.txt"의 8쪽을 참조하여 설명할 것이다. Next, the document "Internet Engineering Task Force: draft-ieft-mmusic-spd-new-10.txt" on May 27, this statement several details of the current definition of the Session Description Protocol in 2002 explained by referring to page 8 of will be. 프로토콜의 어떤 기술은 요구되고 어떤 것은 선택적이다. What technology protocol is required and what is not optional. 선택적인 아이템은 '*'로 표시한다. Optional items are marked '*'. 여기에서 <value>는 b=AS SDP 파라미터의 <대역폭값>과 동일한 신택스(syntax)로 표현된다. In this <value> it is represented by <bandwidth value> the same syntax and (syntax) of the b = AS SDP parameter. 이것은 사용자-정의 속성이다. This user-defined attributes are. 이 파라미터를 정의하는 변형적인 방법은 새로운 대역폭 기술자(descriptor)를 이용하는 것이다. Modified way to define this parameter is to use a new bandwidth descriptor (descriptor). X-기술자는 SDP의 실험적 기술자를 나타낸다. X- descriptors indicate experimental descriptors for SDP. 이는 세션 또는 미디어에 의해 이용될 제안된 대역폭을 지정하며 선택적이다. This is optional and specifies the proposed bandwidth to be used by the session or media. <대역폭-값>은 디폴트에 의한 초당 킬로비트이다. <Bandwidth-value> is in kilobits per second by default. 변형자들은 대체 유닛들이 이용될 것을 지정할 수 있다. Modifier may specify that alternative units are to be used. CT(컨퍼런스 총계): 세션 또는 세션 미디어의 대역폭이 유효 범위로부터 암시되는 대역폭과 상이하면, 'b=CT...' 라인이 제안된 상한을 이용된 대역폭에 제공하도록 세션에 대해 제공되어야 한다. CT (Conference Total): to be provided for the session to provide the bandwidth using the bandwidth and when different, 'b = CT ...' line of the proposed upper limit to be implied from the valid range of the bandwidth of a session or media session. 이것의 제1 목적은 2이상의 세션이 동시에 공존할 수 있는지 여부에 대하여 개략적인 아이디어를 제공하는 것이다. Its first object is to provide a rough idea as to whether or not two or more sessions can coexist simultaneously. AS(애플리케이션-특정 최대값): 대역폭은 애플리케이션-특정되도록 번역되며, 즉, 애플리케이션의 최대 대역폭 개념이 될 것이다. AS (Application-Specific Maximum): The bandwidth is application-specific and translated so that, i.e., will be a maximum bandwidth concepts of the application. 대개, 응용가능하다면, 이것은 애플리케이션의 '최대 대역폭' 제어로 설정되는 것과 일치할 것이다. Usually, if applicable, this will match those set in the "maximum bandwidth" control applications. RTP 기반 애플리케이션에 대해, AS는 (미디어 비트 레이트 및 UDP/IP 헤더 오버헤드를 포함하여) RFC 1889(RTP)의 섹션 6.2.에서 정의된 바와 같은, RTP "세션 대역폭"을 제공한다. For RTP based applications, AS gives the, RTP "session bandwidth" as defined in section 6.2 of RFC 1889 (RTP) (including media bit rate and UDP / IP headers overhead). 실시간 스트리밍 프로토콜은 실시간 특성으로 데이터의 전달을 제어하는 클라이언트-서버 프로토콜이다. Real Time Streaming Protocol is a client for controlling the transfer of data in real-time characteristic-server protocol. 이것은 오디오와 비디오 같은 연속적 미디어의 단일 또는 여러 시간-동기화된 스트림을 확립하고 제어하는데 이용된다. This is a single or a few hours of continuous media such as audio and video - is used to establish and control the synchronized stream. RTSP는 UDP와 TCP와 같은 전송 프로토콜로 전달된다. RTSP is conveyed with transport protocols such as UDP and TCP. 즉, RTSP는 멀티미디어 서버용 네트워크 원격 제어로서 동작한다. In other words, RTSP acts as a network remote control a multimedia server. 데이터 소스는 데이터 피드(예를 들어, 실시간 비디오 및/또는 오디오) 및 저장된 클립(예를 들어, 정지 화상) 양자를 포함할 수 있다. Data source may comprise a data feed (e.g., real-time video and / or audio) and stored clips (e. G., Still image) both. RTSP 클라이어언트와 서버는, 예를 들어 부분적으로 파라미터들을 서술하는 SDP 신택스를 이용하여 미디어 전달용 파라미터의 적절한 세트를 협의한다. RTSP climb gradient followed by a server, for example, using the SDP syntax to describe those parameters in part will discuss an appropriate set of parameters for media delivery. 여기에서, <값>은 정수(바이트들의 개수)로서 표현된다. Here, the <value> is expressed as integer (number of bytes). 또한 이것은 사용자-정의 속성이다. Also, this user-defined attributes are. 도 1은 무선 통신 장치 (MT1), 기지국(2; BS), 및 기지국(2)을 제어하고 기지국(2)과 시스템의 나머지 사이의 접속을 루팅하는 무선 네트워크 제어기(3;RNC)를 포함하는 무선 액세스 노드(1: RNA)를 포함하며, 무선 네트워크 제어기(3)에 부가하여 루팅 가능성으로서 무선 이동 전화 교환국(4; WMSC) 및 패킷 데이터 액세스 노드(5; PDAN)를 포함하는 UMTS 시스템의 일부를 도시한다. Figure 1 is a wireless communication device (MT1), base stations including a;; (RNC 3) (2, BS), and controls the base station 2 and base station 2 and the radio network controller that routes the connection between the rest of the system some of the UMTS system, comprising an embedded, and a radio network controller 3, a wireless mobile switching center as routing possibilities in addition to the (4;; WMSC) and a packet data access node (PDAN 5): a wireless access node (RNA 1) a is shown. 도 1에 따른 UMTS 시스템은 예를 들어, 백본 네트워크(6)와 인터넷 프로토콜(IP) 네트워크(7)와 같은 다른 패킷 네트워크들로의 패킷 데이터 게이트웨이(8; PDG)도 포함하는데, 이 경우 무선 통신 장치는 예를 들어 IP 네트워크에 결합된 서버(10)와 통신할 수 있다. UMTS system according to Fig. 1, for example, a backbone network 6 and the Internet Protocol (IP) network packet data gateway to other packet networks, such as 7,;, to include (8 PDG) In this case, the radio communication the device may contain a communication with a server 10 coupled to the IP network, for example. 또한, 도 1은 예를 들어 제2 이동 통신 네트워크(NW2)에 결합한 회선 교환 게이트웨이(9)(게이트웨이-이동 서비스 교환국, GWMSC)와, 예를 들어 가입자의 액세스 약정 데이터를 저장하는 홈 로케이션 레지스터(11; HLR)를 도시한다. In addition, FIG. 1, for example, the second mobile communication network (NW2) circuit switched gateway 9 is bonded to the (gateway-mobile services switching center, GWMSC) with, for example, a Home Location to store the subscriber's access arrangement data register ( shows a HLR); 11. 또한, 도 3은 본 발명의 바람직한 실시예에 의한 무선 통신 장치(MT1)를 간략화된 블록도로 도시하며, 이 예에서 상기 통신 장치는 Nokia TM 9210i TM 커뮤니케이터와 같은, 데이터 처리 기능과 이동국 기능을 포함하는 통신 장치이다. In addition, Figure 3 shows a simplified wireless communication device (MT1) according to a preferred embodiment of the invention in block diagram form, the communications device in this example comprises a data processing functions and mobile station functions, such as Nokia TM 9210i TM communicators a communication apparatus. 무선 통신 장치(MT1)는 예를 들어 1 이상의 프로세서(CPU, DSP), 메모리 수단(MEM), UMTS 가입자 식별 모듈(USIM) 또는 가입자를 식별하는 상응하는 수단, 및 기지국(2)과 통신하는 무선부(RF)를 포함한다. A wireless communication device (MT1), for example one or more processors (CPU, DSP), memory means (MEM), UMTS Subscriber Identity Module (USIM) or corresponding means for identifying the subscriber, and the base station 2 and the communication radio to and a section (RF). 프로세서(CPU)는, 예를 들면 무선 통신 장치(MT1)의 다수개의 논리적 기능들을 수행할 수 있는 주문형 반도체(12; ASIC)에 통합될 수 있다. Processor (CPU), for example, an application specific integrated circuit (12; ASIC) to perform a plurality of logical functions of the wireless communication device (MT1) it may be incorporated into the. 메모리 수단은 램(RAM), 롬(ROM), 및 가입자 식별 모듈(USIM)의 메모리의 적어도 일부를 포함하는 것이 바람직하다. Memory means preferably comprise at least a portion of the memory of random access memory (RAM), read-only memory (ROM), and a subscriber identity module (USIM). 무선 통신 장치(MT1)는 1 이상의 사용자 인터페이스도 포함하며, 이러한 사용자 인터페이스는 바람직하게는 키패드(13, 14), 디스플레이 장치(15, 16) 및 예를 들어, 마이크로폰(17), 스피커(18) 및 코덱(19)과 같은 오디오 수단을 포함한다. A wireless communication device (MT1) comprises also at least one user interface, such a user interface is preferably a keypad 13,14, a display device (15, 16) and, for example, a microphone 17, a speaker 18 It includes audio means, such as a codec and 19. 도 1에서, 통화 관리(CM)에 관련된 기능은 무선 통신 장치(MT1)에서 구현되고 무선 이동 전화 교환국(4)과 패킷 데이터 액세스 노드(5) 양자에서 구현된다고 가정한다. 1, the functions related to call management (CM) is assumed to be implemented in a wireless communication device (MT1) is implemented in both the wireless mobile switching center 4 and the packet data access node 5. 이들 통화 관리 기능은 통화를 초기화하고 유지하며 종료하는 수단을 구성한다. These call management functions constitute the means for initializing the call, maintain and terminate. 결과적으로, 무선 통신 장치(MT1)와 무선 이동 전화 교환국(4) 또는 패킷 데이터 액세스 노드(5)는 통화를 초기화하고, 유지하고 종료하는 통화 시그널링 메시지들을 교환한다. As a result, the wireless communication device (MT1) and the wireless mobile switching center 4 or the packet data access node 5 exchange call signaling messages to initialize a call, maintain and terminate. 베어러 관리(BM)와 무선 자원 관리(RM)의 기능은 무선 통신 장치 (MT1)와 무선 네트워크 제어기(3)에서 구현된다. Functions of bearer management (BM) and radio resource management (RM) are implemented in the wireless communication device (MT1) and a radio network controller (3). 베어러 관리 기능들은 예를 들어, 무선 통신 장치(MT1)와 기지국(2) 사이의 통신에 대해 선택된 베어러 서비스의 특성에 따라 한 개 또는 여러 개의 논리 채널들을 선택하여, 베어러 서비스에 따른 서비스 품질을 제공하도록 이용된다. Bearer management functions include, for example, by selecting one or several logical channels according to the characteristics of the selected bearer services for communication between the wireless communication device (MT1) and a base station (2), providing a quality of service of the bearer service to be used. 예를 들어, 무선 자원 관리 기능은 무선 통신 장치(MT1)와 기지국(2) 사이의 무선 통신을 위한 무선 채널을 선택하는데 이용된다. For example, the radio resource management functions are used to select the radio channel for the radio communication between the wireless communication device (MT1) and a base station (2). 무선 통신 장치(MT1)와 IP 네트워크(7) 사이의 패킷 데이터 송신 접속은 패킷 데이터 백본(6)과 패킷 데이터 게이트웨이(8; PDG)를 통하여 패킷 데이터 액세스 노드(5; PDAN)로부터 설정될 수 있다. Packet data transmission connection between the wireless communication device (MT1) and the IP network 7 is the packet data backbone 6 and the packet data gateway (8; PDG); may be set from (PDAN 5) via the packet data access node . 무선 통신 장치(MT1)와 무선 액세스 노드(1), 무선 이동 전화 교환국(4) 및 게이트웨이-이동 서비스 교환국(9; GWMSC)을 통한 이동 통신 네트워크 사이의 회선 교환 데이터 송신 접속을 설정하는 것이 가능하다. It is possible to set up a circuit switched data transmission connection between the mobile communication network via; (GWMSC 9) mobile services switching center - a wireless communication device (MT1) and a radio access node 1, the wireless mobile switching center 4 and the gateway, . 상기 게이트웨이-이동 서비스 교환국(9)은 이동 통신 네트워크와 GSM, PSTN 또는 ISDN과 같은 제2 네트워크(NW2) 사이의 접속을 설정하는 수단을 포함한다. The gateway-mobile services switching center 9 comprises means for setting a connection between the second network (NW2), such as a mobile communication network and the GSM, PSTN or ISDN. 기본적으로, 본 발명은 2개의 상이한 유형의 상황: 스트리밍 멀티미디어 애플리케이션과 대화식 멀티미디어 애플리케이션에 적용될 수 있다. Basically, the invention is of two different types of situations: streaming multimedia applications and may be applied to a conversational multimedia application. 다음으로, 멀티미디어 애플리케이션을 스트리밍하기 위한 본 발명의 바람직한 실시예에 따른 방법은 도 1의 시스템을 참조하여 설명될 것이다. Next, a method according to an embodiment of the present invention for streaming multimedia applications will be described with reference to the system of Fig. 무선 통신 장치(MT1)의 사용자는 예를 들어 무선 통신 장치(MT1)의 사용자 인터페이스를 통해 무선 통신 장치(MT1)의 애플리케이션을 시작한다. The user of the wireless communication device (MT1), for example, starting the application of the wireless communication device (MT1) through the user interface of a wireless communication device (MT1). 애플리케이션은, 네트워크에서, 예를 들어 게임, 멀티미디어 애플리케이션, 무선 채널 청취 애플리케이션, 서류 뷰잉 애플리케이션, 또는 WWW 브라우저와 같은 브라우저 애플리케이션이다. The application is a browser application such as in a network, for example, games, multimedia applications, wireless channel listening application, document viewing application, or a WWW browser. 이 애플리케이션의 프로그램 코드는 예를 들어, IP 네트워크에 결합된 서버(10)로부터 프리로드되고 무선 통신 장치의 메모리 수단(MEM)에 저장될 수 있다. The program code of this application are described, for example, pre-loaded from a server 10 coupled to the IP network and can be stored in the memory means (MEM) of a wireless communication device. 무선 통신 장치(MT1)는 그러한 애플리케이션을 실행하는 실행 환경을 가진다. A wireless communication device (MT1) has an execution environment for executing such applications. 이것은 애플리케이션에 의해 송신되는 서비스 요청에 의해 활성화된다. It is activated by a service request transmitted by the application. 무선 통신 장치의 실행 환경 기능은, 예를 들어 애플리케이션의 서비스 품질에 관련된 요구사항들을 결정하는 것이다. Execution environment functions of the wireless communication device is, for example, to determine the requirements related to the quality of service of the application. 실행 환경과 요청된 애플리케이션의 수행은 무선 통신 장치의 프로세서(CPU)에 의해서 제어된다. Performing the requested application and the execution environment is controlled by a processor (CPU) of a wireless communication device. 또한, 무선 통신 장치는 한개의 프로세서(CPU)보다 많은 프로세서를 포함하는 것이 가능하지만, 다음에서 그 애플리케이션을 실행하기 위해 단 하나의 프로세서(CPU)가 있다고 가정한 것이다. In addition, the wireless communication device is capable of including a large number of processors than one processor (CPU), but it is assumed that there is only one processor (CPU) for executing the application in the following. 사용자가 워칭을 위한 멀티미디어 프리젠테이션을 선택하고 싶을 경우, 요청이 무선 통신 장치(MT1)에 의해 서버(10)로 전송되어 선택가능한 멀티미디어 프리젠테이션들에 관한 정보를 얻는다. If the user want to select a multimedia presentation for watching, the request is sent to server 10 by a wireless communication device (MT1) to obtain information about the selectable multimedia presentations. 요청은, 예를 들면, RTSP 프로토콜에 따른 DESCRIBE 메시지이다. The request, for example, a DESCRIBE message according to the RTSP protocol. 무선 통신 장치(MT1)는 패킷 교환 스트리밍 클라이언트(PSS 클라이언트)로 간주될 수 있다. A wireless communication device (MT1) can be regarded as the packet switched streaming client (PSS client). 또한, 요청은 해당 스트리밍 서버(패킷 교환 스트리밍 서버, PSS 서버), 예를 들면 IP-네트워크(7)의 서버(10)로 송신된다. In addition, the request is, for the streaming server (packet switched streaming server, PSS server), for example, it is transmitted to the server 10 in the IP- network 7. The 서버(10)는 그 요청을 검사하고 요청된 프리젠테이션의 정보를 검색하여 제안된 프리젠테이션을 송신하는데 필요한 적어도 최대 비트 레이트를 찾아낸다. Server 10 finds at least the maximum bit rate needed to transmit the presentation proposed to retrieve information from the presence check request and the request station. 프리젠테이션은 서버(10)에서 인코딩된 형태로 저장될 수 있으며, 이 경우 서버는 미리 최대 비트 레이트의 정보를 가진다. The presentation may be stored in encoded form in the server 10, in which case the server previously has information of the maximum bit rate. 그러나, 프리젠테이션이 인코딩된 형태로 저장되지 않은 경우(예를 들어, 라이브 프리젠테이션), 서버(10)는 그에 대한 어떤 적절한 방법을 이용하여 최대 비트 레이트를 평가한다. However, if that is not stored in the presentation, the encoding type (e. G., A live presentation), the server 10 evaluates the maximum bit rate by using some suitable method for that. 서버(10)가 최대 비트 레이트에 대한 정보를 수집한 경우, 최대 비트 레이트에 관한 정보는 세션 기술 프로토콜 정의에 속성 필드로서 삽입된다. If the server 10 collects the information about the maximum bit rate, information about the maximum bit rate is inserted as an attribute field in the session description protocol definition. 세션 기술 프로토콜 정의 정보는 서버(10)로부터 IP-네트워크(7)와 무선 네트워크(NW1)를 통하여 무선 통신 장치(MT1)로 송신된다. Session description protocol definition information is transmitted to the IP- network 7 and the wireless network, the wireless communication device (MT1) through (NW1) from the server 10. 이는 서버(10)로부터 무선 네트워크(NW1)를 통하여 무선 통신 장치(MT1)로 응답 메시지를 전송함으로써 수행될 수 있다. This can be done by sending a response message to the wireless communication device (MT1) over a wireless network (NW1) from the server 10. 예를 들어, 메시지는 선택가능한 멀티미디어 프리젠테이션에 관한 정보와 최대 비트 레이트 및 최대 SDU 사이즈 정보와 같은, 멀티미디어 프리젠테이션에 관한 어떤 파라미터를 포함하는 RTSP 프로토콜의 "200/OK" 메시지이다. For example, the message is a "200 / OK" message of the RTSP protocol including, any parameter associated with the multimedia presentation, such as information and maximum bit rate and maximum SDU size information about the selectable multimedia presentations. 사용자가 무선 통신 장치(MT1)에 의해 워칭을 위한 멀티미디어 프리젠테이션을 선택한 경우, SDP 정보는 무선 통신 장치(MT1)에서 검사되고 서버에 의해 제안된 그 파라미터들을 이용하여 PDP 컨텍스트(또는 베어러 서비스)에 대한 요청이 형성되어 무선 통신 네트워크(NW1)에 송신된다. If the user has selected a multimedia presentation for watching by the wireless communication device (MT1), SDP information in using the parameters being examined in the wireless communication device (MT1) proposed by the server, a PDP context (or a bearer service) for the request is formed and transmitted to the wireless communication network (NW1). 그 요청에서 무선 통신 장치(MT1)는 접속에 필요한 최소한 최대 비트 레이트를 정의한다. A wireless communication device (MT1) in the request defines at least the maximum bit rate required for the connection. 다른 파라미터들은, 표 1에 제공된 바와 같이, 예를 들어 최대 SDU 사이즈, 보증된 비트 레이트, 전송 지연 등일 수 있다. 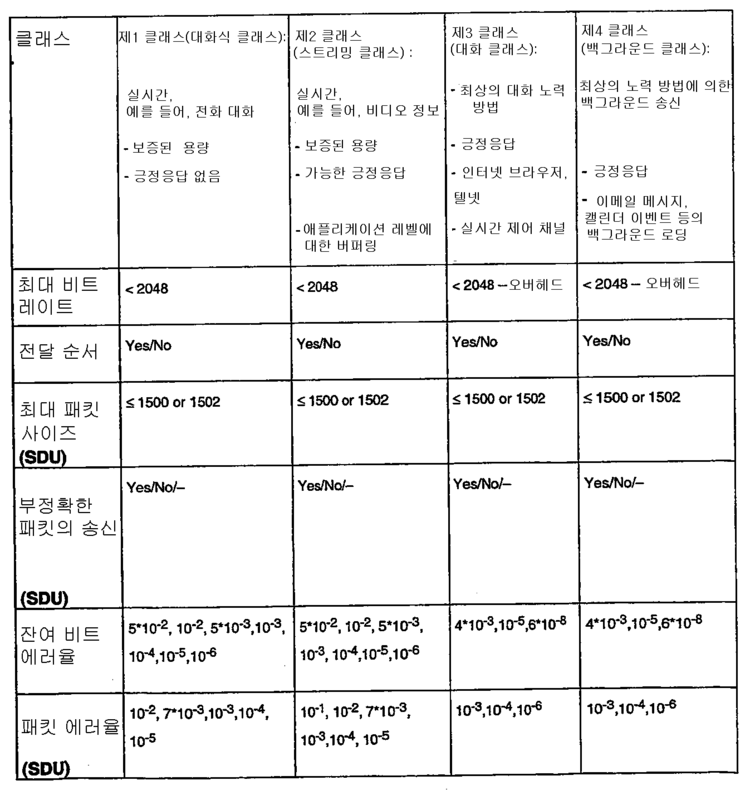 Other parameters, as provided in Table 1, for example, may be a maximum SDU size, guaranteed bit rate, transfer delay. 이 요청은 무선 네트워크(NW1)에서 검사되고 베어러 서비스에 대해 선택이 이루어진다. The request is examined in the wireless network (NW1) selection is made for the bearer service. 무선 통신 네트워크(NW1)는 가급적 요청된 QoS와 정합하며 필요 이상의 네트워크 자원들을 예약하지 않는 그러한 베어러 서비스를 접속에 대해 선택하도록 시도한다. Wireless communication network (NW1) is matched with the requested QoS as possible and try to pick up on such a bearer service that does not reserve the network resources than necessary. 선택된 베어러 서비스에 관한 정보는 무선 통신 장치 (MT1)로 송신된다. Information about the selected bearer service is transmitted to the wireless communication device (MT1). 파라미터들은 서버(10)에 의해 제안된 파라미터들에 대응(동일)할 수 있거나, 예를 들어 사용자의 가능한 가입 제한 또는 불충분한 네트워크 자원들 때문에, 무선 통신 네트워크(NW1)에 의해 다운그레이드될 수 있다. The parameters can be the corresponding (same) to the parameters suggested by the server 10, for example, because of possible subscription limitations or insufficient network resources of the user, it may be downgraded by the wireless communication network (NW1), . 와 같은, 메시지의 헤드 필드로서 통지된다. , It is reported as the head field of the message, such as. 첫번째 2개의 신택스는 대응하는 SDP 속성들에 대해 정의된 것과 동일하다. The first two syntax is the same as that defined for the corresponding SDP attributes. 세번째 속성의 신택스(부여된 전송 지연)는 제2 속성의 신택스와 동일하며, 바람직하게는 밀리초로 표현된다. Syntax (granted transfer delay) of the third attribute is the same as the syntax of the second attribute, and preferably is expressed in milliseconds. 부여된 전송 지연은, 패킷들이 무선 통신 네트워크(NW1)로부터 스트리밍 클라이언트로 송신되는 지연을 나타낸다. The transfer delay is given, it indicates the packets are delayed to be transmitted to the streaming client from a wireless communication network (NW1). 부여된 파라미터들은, 무선 통신 장치(MT1)에서 PDP 컨텍스트가 활성화된 후에 예를 들어 SETUP 메시지나 PLAY 메시지로서, RTSP 메시지들을 이용함으로써 송신되는 것이 유리할 수 있지만, 부여된 파라미터들은 세션의 전수명 동안 RTSP 프로토콜의 다른 메시지나 다른 프로토콜의 메시지를 이용하여 송신될 수도 있다. The parameters, after the PDP context activated in the wireless communication device (MT1), for example as a SETUP message or a PLAY message, but may advantageously be transmitted by using the RTSP message, the parameters given given are for the entire lifetime of the session RTSP Further messages from the protocol or may be transmitted by using a message of another protocol. 바람직한 해법은 무선 통신 장치(MT1)에 의해서 서버(10)로 전송된 제1 SETUP 메시지내에 2개의 헤더들을 끼워넣는 것이다. The preferred solution is to embed the two headers in the first SETUP message 1 sent to the server 10 by the wireless communication device (MT1). 메시지가 수신된 후에, 서버(10)는 부여된 QoS 파라미터들이 제안된 파라미터들에 대응하는지 여부를 검사한다. After the message is received, the server 10 checks whether the granted QoS parameters correspond to the suggested parameters. 제안된 파라미터들과 부여된 파라미터들 간에 상당한 차이가 있는 경우에, 서버(10)는 송신될 멀티미디어 스트림의 송신 설정을 변경할지 여부를 결정할 수 있다. If there is a significant difference between the grant and the proposed parameters parameters, the server 10 may determine whether to change the transmission settings of the multimedia stream to be transmitted. 예를 들어, 서버는 부여된 QoS 파라미터들에 가장 적합한 방법으로 패킷화된 방법을 변경할 수 있다. For example, the server can change the packetization method in the most appropriate way to the QoS parameters granted. 서버는 필요하다면 SDU 사이즈를 변경할 수도 있다. The server can also change the SDU size if necessary. 서버(10)로부터의 요청된 멀티미디어 프리젠테이션의 송신은, 접속이 무선 통신 장치(MT1)에 대해 확립된 후에 시작할 수 있다. Transmission of the requested multimedia presentation from the server 10 is connected can start after the established for the wireless communication device (MT1). 송신은 바람직하게는 패킷 포맷으로 수행되며, 이 경우 멀티미디어 프리젠테이션은 IP-네트워크(7)에서 이용되는 프로토콜의 패킷들로 캡슐화된다. Transmission is preferably performed in a packet format, in which case the multimedia presentation is encapsulated into packets of the protocol to be used in the IP- network 7. The 예를 들어 패킷들은 IP-패킷이다. For example, packets are the IP- packet. 무선 네트워크(NW1)에서, IP-패킷은 프로토콜 및 무선 네트워크(NW1)에 의해 전달된다. The wireless network (NW1), IP- packets are delivered by protocols and the wireless network (NW1). 프리젠테이션은 비트 레이트가 세션의 보증된 비트 레이트를 초과하는 그러한 부분들을 포함할 수 있다. The presentation has a bit rate can include that portion that exceeds the guaranteed bit rate of the session. 그러나, 최대 비트 레이트에 따라 자원들을 예약하는 것이 적합하지 않을 수 있으므로, 예를 들면 평균 비트 레이트가 고려될 수 있다. However, it may be unacceptable to reserve the resources according to the maximum bit rate, for example, the average bit rate can be considered. 본 발명의 다른 바람직한 실시예에 따른 방법에서, 다른 파라미터, 그 자체로 알려진 델타 대역폭이 상술한 상황에서 이용될 수 있다. In the method according to a further preferred embodiment of the invention, a delta bandwidth known as other parameters, may themselves be used in the above-described circumstances. 이 파라미터는 최대 비트 레이트와 보증된 비트 레이트 간의 차이를 표현하고, 따라서 최대 비트 레이트-보증된 비트 레이트로 계산될 수 있다. This parameter represents the difference between the bit rate and guarantee a maximum bit rate, and hence the maximum bit rate may be calculated as a guaranteed bit rate. 이 델타 대역폭은 대역폭 적응에 이용되거나 비디오 비트 레이트의 피크를 조정하는데 이용될 수 있다. This delta bandwidth is used for bandwidth adaptation or may be used to adjust the peak of the video bit rate. 또한, 이 델타 대역폭은, 실시간으로 멀티미디어 스트림을 인코딩할 때, 예를 들어 비트 레이트에 영향을 미치는 인코딩 파라미터를 신속하게 변경함으로써, 최상의 미디어 품질을 전달하는데 이용될 수 있다. In addition, this delta bandwidth, when encoding multimedia streams in real-time, for example, by rapidly changing the encoding parameters that affect the bit rate, may be used to deliver the best media quality. 멀티미디어 스트림을 인코딩하는데 2이상의 변형이 있는 것도 가능하다. To encode the multimedia streams is also possible that two or more variants. 이 장점의 예는 다음과 같다: PSS 클라이언트는 PSS 서버에 DESCRIBE RTSP 메시지를 전달한다. Examples of the advantages are as follows: The PSS client has passed a DESCRIBE RTSP message to the PSS server. 서버는 (소위 "200/OK" 응답 메시지에 포함된) SDP 기술로 응답한다. The server responds with a SDP description (included in so-called "200 / OK" response message). SDP 기술은 다수의 동일한 멀티미디어 스트림의 대체물들을 포함하고, 이들 각각은 상이한 평균 및/또는 최대 비트 레이트가 타겟으로 정해져 있다(예를 들어: 선택 1- GBR = 64kbps, MBR = 64; 선택 2 - GBR = 64, MBR = 128). SDP description contains multiple alternatives of the same multimedia stream, each of which has a different average and / or maximum bit rate defined as a target (for example: selected 1- GBR = 64kbps, MBR = 64; select 2 - GBR = 64, MBR = 128). 평균 비트 레이트 보다 높은 최대 비트 레이트는 예를 들어 초기 버퍼링의 기간을 감소시키는데 이용될 수 있다. High maximum bit rate than the average bit rate is contained can be used to reduce the duration of initial buffering, for example. PSS 클라이언트는 최종-사용자 선호도 및 단말 성능들에 따라 바람직한 미디어 스트림을 선택하고 바람직한 스트림의 평균 비트 레이트 및 최대 비트 레이트와 정합하는 QoS 프로파일로 PDP 컨텍스트를 요청한다. PSS client end and selects the preferred media stream according to the user preferences and terminal capabilities and requests a PDP context to the average bit rate and maximum bit rates and QoS profile matching that of the preferred stream. 부여된 QoS 프로파일 파라미터들이 요청된 것보다 낮으면, PSS 클라이언트는 대체 미디어 스트림을 선택해야 하고, 그 미디어 스트림의 비트 레이트 파라미터는 부여된 QoS 프로파일 파라미터들의 범위에 부합한다. If granted QoS profile parameters are lower than requested, PSS client should select alternative media stream, and the bit rate parameter of the media stream will meet the scope of the granted QoS profile parameters. 마지막으로, PSS 클라이언트는 선택된 미디어 스트림을 나타내게 하는 SETUP 요청을 PSS 서버로 전달한다. Finally, PSS client sends a SETUP request to exhibit the selected media stream to the PSS server. 도 2는 본 발명이 적용될 수 있는 다른 상황을 도시한다. Figure 2 shows another situation that can apply the present invention. 이는 대화식 멀티미디어 애플리케이션에 관련된다. This is related to interactive multimedia applications. 예를 들어, 대화식 멀티미디어 애플리케이션을 이용함으로써, 1 이상의 통신 네트워크(NW1)를 통하여 서로 통신하는 2 이상의 무선 통신 장치들이 있다. For example, by using conversational multimedia application, there are two or more wireless communication devices communicating with each other via at least one communication network (NW1). 제1 무선 통신 장치(MT1)는 무선 통신 네트워크(NW1)에의 부가와 PDP 컨텍스트 활성화를 수행하여 네트워크를 통한 패킷 데이터 통신을 시작한다. The first wireless communication device (MT1) starts the packet data transmission over the network to perform the addition and the PDP context activation to the radio communication network (NW1). 그 절차들 자체가 공지되어 있고, 이 점에서 본원에 더 상세하게 설명할 필요가 없을 것이다. And that the steps themselves are known, at this point will not have to be described in more detail herein. 또한, 제2 무선 통신 장치(MT2)는 동일한 무선 통신 네트워크(NW1)와 유사한 태스크를 수행하거나 다른 무선 통신 네트워크(미도시)와 유사한 태스크를 수행한다. Further, the second wireless communication device (MT2) performs similar tasks with the same wireless communication network (NW1), or perform a similar task, with the other wireless communication network (not shown). 무선 통신 네트워크(NW1)는 PDP 컨텍스트를 위해 무선 통신 장치(MT1, MT2)용의 특정 자원들을 예약한다. A wireless communication network (NW1) reserves certain resources for the wireless communication device (MT1, MT2) for the PDP context. 제1 무선 통신 장치(MT1)는 최대 비트 레이트를 제2 무선 통신 장치(MT2)에 통지하고, 제1 무선 통신 장치(MT1)는, 멀티미디어 스트림을 제2 무선 통신 장치(MT2)로 송신하기 위해 인코딩할 때 상기 최대 비트 레이트를 이용하도록 허용된다. The first wireless communication device (MT1) is notified of the maximum bit rate in the second wireless communication device (MT2), and the first wireless communication device (MT1), in order to transmit a multimedia stream to the second wireless communication device (MT2) when encoding is permitted to use said maximum bit rate. 최대 비트 레이트 정보는 세션 기술 프로토콜의 상술된 속성 필드를 이용함으로써 통지될 수 있다. The maximum bit rate information may be notified by using the above described attribute field of the session description protocol. 대응하여, 제2 무선 통신 장치(MT2)는 미디어 정보 인코딩 프로세스의 최대 비트 레이트를 제1 무선 통신 장치(MT1)에 통지할 수 있다. Correspondingly, the second wireless communication device (MT2) may notify the maximum bit rate of the media information encoding process in the first wireless communication device (MT1). 그러나, RTSP 메시지들은 대화식 멀티미디어 애플리케이션에 응용할 수 없다. However, RTSP message can not apply for interactive multimedia applications. 필요한 정보가 세션의 다른 파티로 송신될 때, 통신이 시작할 수 있다. When the required information is sent to the other party in the session, the communication can start. 무선 통신 장치(MT1, MT2) 양자는 최대 비트 레이트 및/또는 최대 SDU 사이즈를 인식하는데, 이 경우 무선 통신 장치(MT1, MT2)는 파라미터들에 따라 송신에 적응할 수 있다. For both a wireless communication device (MT1, MT2) is aware of the maximum bit rate and / or maximum SDU size, when the wireless communication device (MT1, MT2) may adapt the transmission according to the parameters. 또한, 무선 통신 장치(MT1, MT2)는 세션의 다른 파티로 채택된 파라미터들을 통지할 수 있다. In addition, the wireless communication device (MT1, MT2) may notify the parameters employed by the other party of the session. 채택된 파라미터는, 예를 들면 다음: 부여된 최대 비트 레이트, 부여된 최대 서비스 데이터 유닛 사이즈 및/또는 부여된 전송 지연 중 1 이상을 포함한다. The adopted parameters include, for example:: comprises granted maximum bit rate, the granted maximum service data unit size and / or at least one of a transmission delay given. 도 4a는 서버(10)로부터 무선 통신 장치(MT1)로 스트리밍 애플리케이션을 송신하기 위한 시스템의 예를 단순화된 도면으로 도시한다. Figure 4a illustrates as a simplified diagram an example of a system for transmitting streaming applications to the wireless communication device (MT1) from a server (10). 화살표(410)는 스트리밍 애플리케이션의 송신 흐름을 나타낸다. Arrow 410 represents the transmission flow of the streaming application. 점선으로 된 화살표(402)는 스트리밍 애플리케이션의 설정 동안의 제안된 파라미터 및 부여된 파라미터들에 관한 정보의 송신을 나타낸다. The dotted arrow (402) indicates the transmission of information about the parameters and the parameters set for the given propose of the streaming application. 도4b는 무선 통신 장치(MT1, MT2) 사이의 일방향 대화식 애플리케이션(일방향, 화살표 403) 또는 2방향 대화식 애플리케이션(양방향, 화살표 404)을 수행하는 시스템의 예를 단순화된 도면으로 도시한다. Figure 4b shows a simplified diagram of an example of a system that performs the one-way interactive applications (unidirectional, arrows 403) or two-way interactive applications (bidirectional, arrows 404) between wireless communication device (MT1, MT2). 화살표(403 및 404)는 각각 대화식 애플리케이션의 송신 흐름을 나타낸다. Arrows (403, 404) represents the transmission flow of each interactive application. 점선으로 표시된 화살표(405)는 대화식 애플리케이션의 설정 동안 메시지들의 송신을 도시한다. The arrow 405 indicated by a broken line shows the transmission of messages during the set up of the interactive application. 본 발명이 상기의 실시예에만 한정되지 않으며 첨부된 청구범위 내에서 변형될 수 있음은 명백하다. That the invention is not limited to the above embodiments can be modified within the scope of the appended claims it will be apparent. -부여된 전송 지연 중 적어도 하나를 포함하여 송신 통신 장치로 송신되는 것을 특징으로 하는 통신방법. - including at least one of a given transmission delay communication characterized in that the transmission to the sending communication device. -최대 서비스 데이터 유닛 사이즈 중 적어도 하나를 통지받는 통신방법. - a communication method to be notified at least one of a maximum service data unit size. 상기 세션 기술 프로토콜의 속성 필드는 상기 수신 통신 장치로 상기 적어도 하나의 파라미터를 통지하는데 이용되는 통신방법. Attribute field of the session description protocol is a communication method which is used for reporting the at least one parameter to the receiving communication device. 상기 선택된 멀티미디어 스트림을 수신하기 위해 상기 수신 통신 장치에 대한 통신 자원들을 예약하는 단계를 포함하는 통신방법. The communication method includes the step of reserved communication resources for the receiving communication device for receiving the selected multimedia stream. 상기 수신 통신 장치에 대한 통신 자원을 예약하는 단계에서, 상기 자원의 예약은 상기 최대 비트 레이트를 이용하여 수행되는 통신방법. In the step of reserved communication resources for the receiving communication device, wherein the reservation of resources is the communication is performed using the maximum bit rate. 상기 선택된 멀티미디어 스트림은 스트리밍 멀티미디어 애플리케이션인 통신방법. The selected multimedia stream is a streaming multimedia application communication method. 상기 스트리밍 멀티미디어 애플리케이션이 상기 서버에서 상기 인터넷으로, 그리고 스트리밍 멀티미디어 애플리케이션이 상기 예약된 자원을 이용하여 상기 수신 무선 통신 장치로 송신되는 무선 통신 네트워크로 송신되는 통신방법. The communication method wherein the streaming multimedia application transmitted from the server to the wireless communication network to the Internet, and the streaming multimedia application using the above resource reservation to be transmitted to the receiving wireless communication device. 상기 수신 무선 통신 장치는 상기 최대 서비스 데이터 유닛 사이즈에 따라 상기 서비스 데이터 유닛에 대한 저장 용량을 예약하는 통신방법. The receiving wireless communication device is a communication method for scheduling the storage capacity for the serving data units according to the maximum service data unit size. 상기 수신 통신 장치에 대한 예약된 통신 자원에 관한 정보는 실시간 송신 프로토콜의 SETUP 메시지 또는 PLAY 메시지를 이용하여 상기 송신 통신 장치로 송신되는 통신방법. The communication method information relating to the reserved communication resources for the receiving communication device by using a SETUP message or a PLAY message of a real-time transmission protocol, which is transmitted to the sending communication device. 상기 최대 비트 레이트 파라미터는 상기 최대 비트 레이트에 대한 kbit단위의 값을 포함하는 통신방법. The maximum bit rate parameter is a communication method that includes the value of the unit kbit for the maximum bit rate. 상기 최대 서비스 데이터 유닛 사이즈 파라미터는 상기 최대 서비스 데이터 유닛 사이즈에 대한 정수값을 포함하는 통신방법. The maximum service data unit size parameter is a communication method including the integer value for the maximum service data unit size. 임의의 송신 패킷에 대한 제안된 최대 전송 지연도 통지되는 통신방법. The communication method is notified also the maximum transfer delay for any suggestion of the transmission packet. 상기 동일한 멀티미디어 스트림의 다수의 대체물이 존재하고, 각각은 상이한 평균 비트 레이트들 및 상이한 최대 비트 레이트들 중 적어도 하나에 대해 타겟으로 정해지고, 상기 평균 비트 레이트보다 큰 최대 비트 레이트가 초기 버퍼링 시간의 지속을 감소시키는데 이용되는 통신방법. There are many alternatives of the same multimedia stream, wherein, each of the different average bit rate and is determined as the target for at least one of the different maximum bit rate, the larger the maximum bit rate greater than the average bit rate, the duration of initial buffering time, the communication method is used to decrease. -부여된 전송 지연 중 적어도 하나를 포함하여 상기 제1 통신 장치로 송신되는 것을 특징으로 하는 통신방법. - including at least one of a given transmission delay communication characterized in that the transmission to the first communication device. -최대 서비스 데이터 유닛 사이즈 중 적어도 하나를 통지받는 것을 특징으로 하는 통신방법. Communications method according to claim notified at least one of a maximum service data unit size. 상기 세션 기술 프로토콜의 속성 필드는 상기 적어도 하나의 파라미터를 상기 수신 통신 장치에 통지하는데 이용되는 통신방법. Attribute field of the session description protocol is a communication method that is used to communicate the at least one parameter to the receiving communication device. -부여된 전송 지연 중 적어도 하나를 포함하여 상기 송신 통신 장치로 송신되는 것을 특징으로 하는 통신 시스템. - Communication system according to claim, including at least one of a given transmission delay is transmitted to the sending communication device. 네트워크 자원의 예약을 위해 상기 수신 통신 장치로 적어도 상기 파라미터를 송신하는 송신기를 더 포함하는 통신 시스템. For reservation of network resources, the communication system further comprising a transmitter for transmitting at least said parameter to the receiving communication device. 상기 통신 시스템은 상기 정의된 파라미터의 값으로 상기 세션 기술 프로토콜의 속성 필드를 설정하는 메시지 컴포저를 포함하는 통신 시스템. Wherein the communication system is a communication system including a message composer to set an attribute field of the session description protocol to the value of the parameters defined above. 상기 통신 시스템은 상기 선택된 멀티미디어 스트림을 수신하기 위해 상기 수신 통신 장치에 대한 통신 자원을 예약하도록 구성되는 무선 액세스 노드를 더 포함하는 통신 시스템. Wherein the communication system is a communication system further comprising: a wireless access node is configured to reserve communication resources for the receiving communication device for receiving the selected multimedia stream. 상기 무선 액세스 노드는 상기 선택된 멀티미디어 스트림을 수신하기 위해 상기 수신 통신 장치에 대한 통신 자원의 예약에 상기 최대 비트 레이트를 이용하도록 구성되는 통신 시스템. The radio access node is a communication system for reservation of communication resources for the receiving communication device for receiving the selected multimedia stream is configured to use said maximum bit rate. 상기 수신 통신 장치는 상기 무선 액세스 노드에 의해서 부여된 통신 자원에 관한 정보를 상기 송신 통신 장치로 송신하는 수단을 포함하는 통신 시스템. The receiving communication device is a communication system comprising means for transmitting information about the granted communication resources by the radio access node to the transmitting communication device. 상기 멀티미디어 스트림은 스트리밍 멀티미디어 애플리케이션에 이용되는 통신 시스템. The multimedia stream is a communication system for use in a streaming multimedia application. 상기 스트리밍 멀티미디어 애플리케이션의 멀티미디어 스트림은 서버에서 인터넷으로, 그리고 멀티미티어 스트림이 예약된 자원을 이용하여 상기 수신 무선 통신 장치로 송신되는 무선 통신 네트워크로 송신되는 통신 시스템. The streaming multimedia streams of the multimedia application from the server to the Internet, and Meteor multi-stream communication system to be transmitted using the reserved resources to the wireless communications network to be transmitted to the receiving wireless communication device. 상기 수신 무선 통신 장치는 최대 서비스 데이터 유닛 사이즈에 따라 상기 서비스 데이터 유닛에 대한 저장 용량을 예약하기 위한 메모리를 포함하는 통신 시스템. The receiving wireless communication device is a communication system that includes a memory for reserving storage capacity for the serving data units according to the maximum service data unit size. 상기 수신 통신 장치에 대한 예약된 통신 자원에 관한 정보는 실시간 송신 프로토콜의 SETUP 메시지 또는 PLAY 메시지로서 상기 송신 통신 장치로 송신되는 통신 시스템. Information relating to the reserved communication resources for the receiving communication device as a SETUP message or a PLAY message of a real-time transmission protocol, the communication system to be transmitted to the sending communication device. -부여된 전송 지연 중 적어도 하나를 포함하여 제2 통신 장치에 대해 예약된 통신 자원에 대한 정보를 상기 제1 통신 장치로 송신하는 송신기를 포함하는 것을 특징으로 하는 통신 시스템. - the communication system comprises a transmitter for transmitting to the first communication device information on communication resources reserved for the second communication device comprises at least one of a given transmission delay. 네트워크 자원의 예약을 위해 제2 통신 장치로 적어도 상기 파라미터를 송신하는 송신기를 더 포함하는 통신 시스템. Further comprising: a first communication system transmitter for transmitting at least said parameter to the second communication device for reservation of network resources. -부여된 전송 지연 중 적어도 하나를 포함하는 것을 특징으로 하는 송신 통신 장치. - sending communication device comprises at least one of the granted transfer delay. 네트워크 자원의 예약을 위해 상기 수신 통신 장치로 적어도 상기 속성 필드를 송신하는 송신기를 더 포함하는 송신 통신 장치. For reservation of network resources, the transmitting communication device further comprises a transmitter for transmitting at least said attribute field to the receiving communication device. -부여된 전송 지연 중 적어도 하나를 포함하여 상기 수신 통신 장치에 대해 예약된 통신 자원에 대한 정보를 상기 송신 통신 장치로 송신하는 송신기를 포함하는 것을 특징으로 하는 수신 통신 장치. - receiving communication apparatus information about the communication resources reserved for the receiving communication device comprises a transmitter for transmitting to the sending communication device including at least one of the granted transfer delay. 상기 송신기는 상기 선택된 멀티미디어 스트림을 수신하기 위해 네트워크 자원의 예약 요청을 송신하기에 적합한 수신 통신 장치. The transmitter includes a receiving communication device adapted to transmit a reservation request for network resources for receiving the selected multimedia stream. -부여된 전송 지연 중 적어도 하나를 포함하는 것을 특징으로 하는 무선 통신 장치. - a wireless communication device comprises at least one of the granted transfer delay. 네트워크 자원의 예약을 위해 상기 다른 무선 통신 장치로 적어도 상기 파라미터를 송신하는 송신기를 더 포함하는 무선 통신 장치. At least the wireless communication device further comprising a transmitter for transmitting the parameter to the other wireless communication device for reservation of network resources. MXPA03003036A (en) 2000-10-09 2003-06-24 Nokia Corp Method and system for establishing a connection between network elements.